Well, if you are in a search for a Steel Quonset Hut, not only is the type of building and the look important, the construction or the erection of the building is very important. 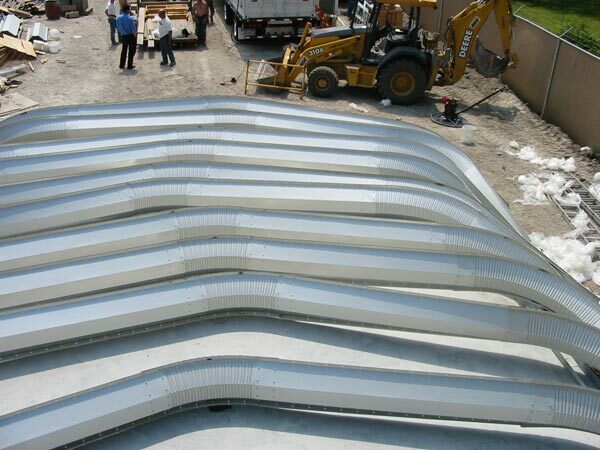 In most instances you will not have to hire a construction crew to erect your Steel Quonset Hut. There are many types of buildings available, tubular steel buildings, Quonset hut kits, rigid frame buildings and c channel buildings. The Steel Quonset Hut or Arch type building is a very common option for the do it your-self type, not only is it cost effective, the Steel Quonset Hut Construction is the most simplest of them all. There is only one size nut and bolt and practically all the work is done on the ground making this type of construction the easiest of all metal buildings. First you layout all the steel arches on the ground and start bolting together each individual piece which are typically no more than forty pounds each. After you have connected all the panels to form an full 2′ section you go on the next arch til you have completed all the arch sections. Here is a picture of rowing your arches out on the ground. In a rigid frame construction at this point of the project you would be standing columns and rafters with a large tele-handler so you would need to be very versed in how to handle large equipment. Steel Quonset huts have been around for you years and started by the government or quick housing. There are even several books written about the Quonset Hut: Metal Living for the Modern Age. Some of the best characteristics of the Steel Quonset Hut is that it can be delivered quickly, offloaded by hand if necessary and erected depending on the size with only a few inexperienced crew. After you have connected all the steel arches, its time to start pulling them up one by one. Steel Quonset Hut construction can be frustrating on the first section as you only have 2 feet and the sections can go back and forth, having proper scaffolding or supports makes this much safer and stable. You repeat this step over and over til all of your arches are connected until complete. You must then add your endwalls and framed openings for doors.